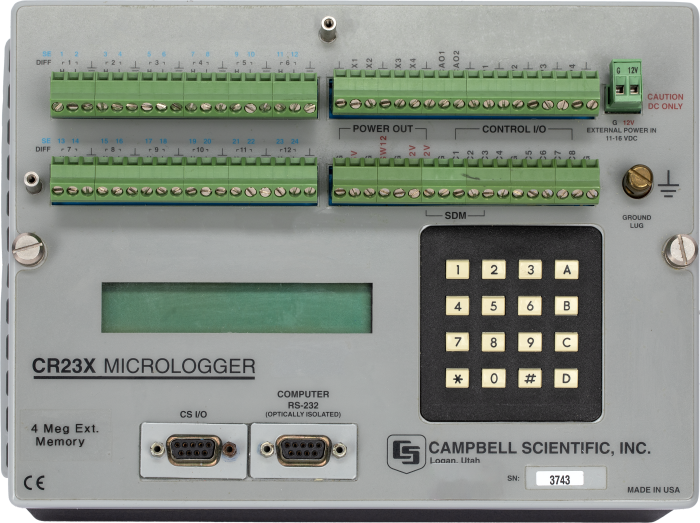 The CR23X is a self-contained, rugged data logger that can measure most sensor types directly, communicate via modems, reduce data, control external devices, and store both data and programs in either non-volatile Flash memory or battery-backed SRAM. The CR23X has an integral, 2-line, alphanumeric display and power supply. A battery-backed, real-time clock and 2M of nonvolatile data storage is included. The CR23Xs are available with a sealed rechargeable battery base, an alkaline base, or in a low-profile version without batteries. The serial I/O capabilities of the CR1000/CR3000 are similar to, and faster than, the SDM-SIO4 capabilities on a CR10X or CR23X. SDM devices are addressable and are connected to a data logger on C1 through C3. 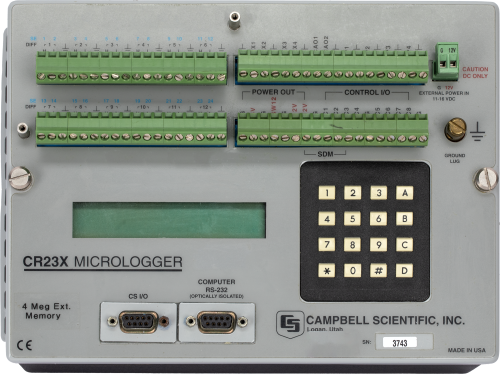 Therefore, one benefit of using multiple SDM devices on a CR1000 datalogger is that only three control ports are used.